FA: John Bachar, Dave Yerian, August 1981. The most famous psychological testpiece in the U.S., the Bachar/Yerian takes the huge black streak up the golden wall of the right side of Medlicott. 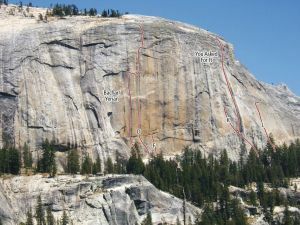 While rated X for the first half of the first pitch, the reputation comes more from lots of steep, sustained, hard climbing with R/X runouts. Many climbers have whipped big off the psychological crux second pitch (often because they got lost in the knobs and ended up too far to the side from a bolt to clip), and the slab climbing on the third pitch is no giveaway. It was originally rated 5.10d and, amazingly, also criticized for the “questionable ethics” of drilling from hooks instead of stance (which would be impossible on the vertical and gently overhung wall). The story of the second ascent by Steve Schneider is harrowing, since he broke a big knob, barn-doored out, saved it and swung back in, clung desperately for a while, then did the exact same thing again on another knob. Which SuperTopo guidebooks include a topo for Bachar Yerian?